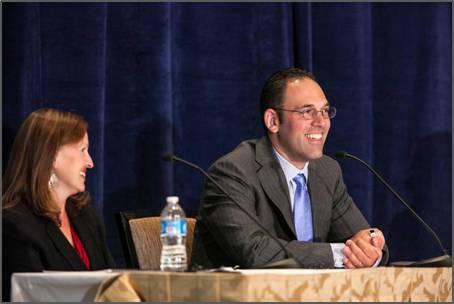 At the recent Association for Advanced Life Underwriting (AALU) Annual Meeting, held in Washington, D.C., May 4-6, Michael Mingolelli, Jr. – who was recently nominated to the AALU Board – spoke on “Managing Life Contracts Post Acquisition” and moderated a product insights panel on whole versus universal life insurance. 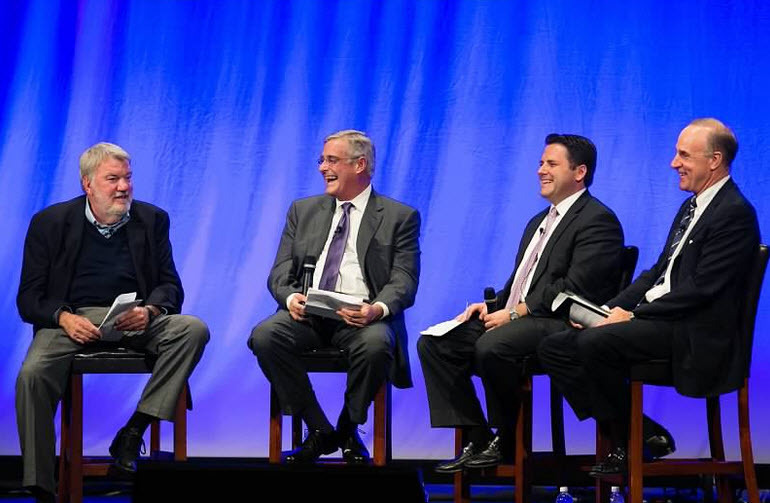 As part of the “Managing Life Contracts Post Acquisition” panel, Michael discussed the strategies Pinnacle uses to manage clients’ life contracts post-acquisition to protect and add value to policies. The “Whole Life / Universal Life: Is There a Better or Best?” panel discussed how to determine what type of life insurance best suits the needs and the levels of risk clients are ready to assume and how to approach these issues with clients to come to a mutually acceptable decision on the purchase of the right life insurance. 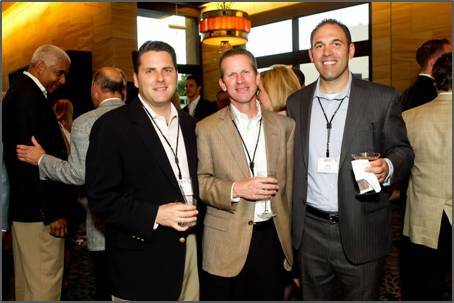 The Forum 400 is an invitation-only organization comprised of the brightest, most innovative life insurance producers and consultants in the industry. For more information about the Forum 400 or NLGUL policy management, please contact us at pinnacle@e-pfg.com. 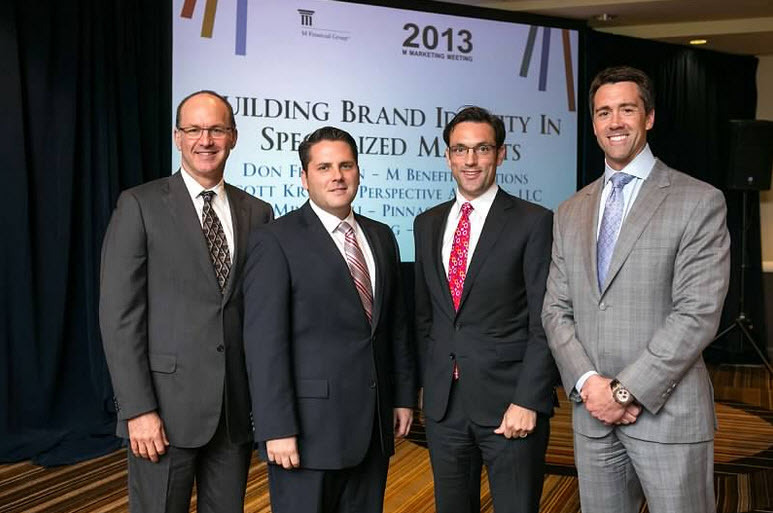 At the 2013 M Marketing Meeting, held October 13-16, in Los Angeles, California, Michael Mingolelli, Jr. contributed his insights as a speaker on two panel discussions. As part of the panel for “Building Brand Identity in Specialized Markets,” Michael shared how Pinnacle’s Private Client Services business has grown by concentrating efforts and expertise very specifically on the ultra-high net worth wealth transfer planning market. 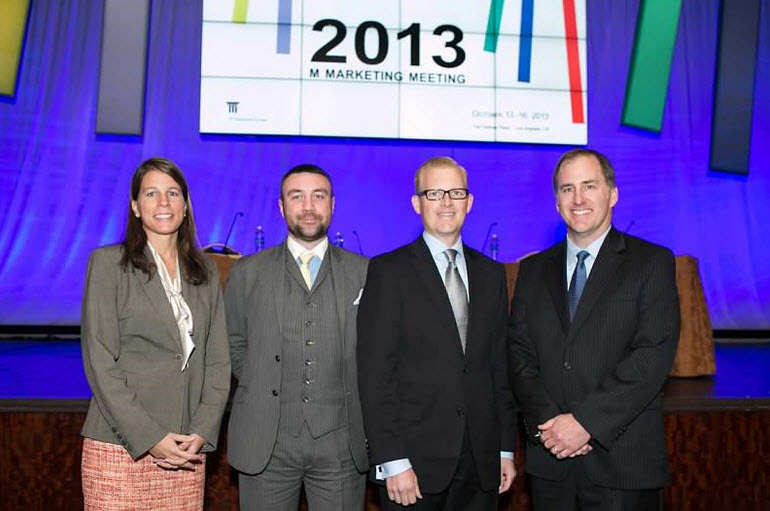 The 2013 M Marketing Meeting’s theme was “Past, Present, Future.” Michael and his co-panelists, Dave Downey of The Downey Group, Terry Horan of Horan Associates, and Campbell Gerrish of Winged Keel Group, closed the 2013 meeting with a compelling, vibrant conversation about the future in “Imagining the M Firm of the Future: Finding and Seizing New Opportunities.” Their discussion covered a wide range of topics including how firms should plan to address challenges and lay the groundwork for differentiation and growth through diversity, technology and transparency. As part of the panel speaking on “The Future of Sales and Marketing: Impact and Advantages of Technology,” Jennifer Root, Marketing Director at Pinnacle, shared Pinnacle’s experience in significantly extending the reach of Pinnacle’s brand and thought leadership largely through digital marketing efforts such as website development, content marketing and social media. On Tuesday, September 11, 2012, Michael Mingolelli, Jr., Esq. moderated the Boston Estate Planning Council (BEPC) seminar on estate, gift, generation-skipping transfer, income and capital gains taxes. Ken Kies, Managing Director of the Federal Policy Group, a division of Clark & Wamberg LLC, was the featured speaker. For more information about the seminar and content, please contact us. If you have any questions regarding these, or other HR and benefits topics, please contact us. Pinnacle, and co-sponsor, Mintz Levin, recently hosted a discussion of some of the most pressing developments in employment law, reviewing sweeping changes in this area that present major challenges for employers. For more employer services insights and updates, visit our Employer Services Insights page. Non-Profit ELITE Seminar Presented with Alexander, Aronson, Finning & Co.
For more information about retirement services issues facing non-profits, please don’t hesitate to contact us. Kevin Coffey, Director of Operations, spoke regarding utilizing technology to enhance client service and driving business growth. Kenneth Masters, Director of Life Insurance Design and Development, shared his insights arding regbuilding effective reports, presentations and analysis. Michael Mingolelli, Jr., Esq., CEO, spoke about working effectively with client advisors. For more information about any of these presentations, please don’t hesitate to contact us. On March 15, 2012, Michael Mingolelli, Jr. presented to the Environmental Business Council of New England regarding how proper tax and succession planning can be vital to the long-term success of any business, especially those aiming to have their firm succeed beyond one generation. On March 13, 2012, Michael Mingolelli, Jr. addressed the Construction Financial Management Association (CFMA) of Massachusetts on the timely planning opportunities for business owners given current tax legislation and favorable interest rates. The presentation explored several planning techniques that mitigate or freeze tax burdens while providing for orderly transition of multi-generational businesses.